Networking confidence: One more thing your mother was right about – My Pinnacle Network and author of Kickass Confidence. Posture was just one example Alissa used as to how you can learn to be a better networker. After all, we can all remind ourselves to stand up straighter, right? Alyssa also debunked the myth of the "born networker". It may seem that some people take to networking more naturally than others, but there is a very good reason as to why. Chances are those individuals grew up with a role model in life who was a good networker. As children are prone to do, they modeled the behaviors of those around them until those behaviors became their own.In other words, those born networkers learned how to network--just at an earlier age. Perhaps the most telling and touching part of the presentation occurred at the end of the meeting. Members, to a person, shared how much they received out the condensed presentation (our format allows for 20 minutes for speakers; Alyssa typically conducts much longer workshops). Yet Alyssa shared how even the founder of ACI has to work on confidence as she confided this was the first speaking engagement she had had since losing a parent. Based on her presentation, you never would have known. For more information on ACI, visit www.americanconfidenceinstitute.com. You can purchase Alyssa's book, Kickass Confidence, on Amazon. Growing up, how many times did your mother remind you to stand up straight? Begrudgingly, you complied, probably just to keep her from reminding you all the time. But what you didn’t know was Mom was trying to make you a better networker. Okay, that was probably not exactly what she was thinking. Yet how you present yourself at a networking event does impact how you are perceived and the level of attention people give to your message. In short, those who stand up straight are more likely to be heard than those who don’t. This was just one of the many nuggets gleaned from a presentation given at the last My Pinnacle Network-Westborough meeting by Alyssa Dver, co-founder of the American Confidence Institute (ACI) and author of Kickass Confidence. Posture was just one example Alissa used as to how you can learn to be a better networker. After all, we can all remind ourselves to stand up straighter, right? Alyssa also debunked the myth of the “born networker”. It may seem that some people take to networking more naturally than others, but there is a very good reason as to why. Chances are those individuals grew up with a role model in life who was a good networker. As children are prone to do, they modeled the behaviors of those around them until those behaviors became their own.In other words, those born networkers learned how to network–just at an earlier age. Perhaps the most telling and touching part of the presentation occurred at the end of the meeting. Members, to a person, shared how much they received out the condensed presentation (our format allows for 20 minutes for speakers; Alyssa typically conducts much longer workshops). Yet Alyssa shared how even the founder of ACI has to work on confidence as she confided this was the first speaking engagement she had had since losing a parent. Based on her presentation, you never would have known. For more information on ACI, visit www.americanconfidenceinstitute.com. 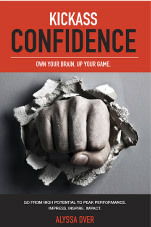 You can purchase Alyssa’s book, Kickass Confidence, on Amazon.